When I think of the Grand Ole Opry, I think of Minnie Pearl and Johnny Cash. I usually don’t imagine a bunch of young guys playing on that stage. And I admit it’s not really something I pay much attention to. But when I found out the Old Crow Medicine Show was a part of the Grand Ole Opry, I thought maybe it’s time to pay more attention to what goes on in Nashville. 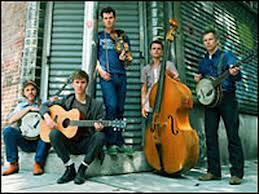 Old Crow Medicine Show is a group of seven guys, who worked their way through the music industry the hard way. They started playing their blue grass old timey music on street corners. And they were on the right street corner one day because they caught eye of an icon in the folk scene, and after a few years they now have a platinum selling single. So all of you buskers reading this don’t give up, the dream really does come true sometimes. These guys don’t play the southern rock you hear on most country stations, they play country music the way it was played in the early days of radio. And that is a lot of the reason I think they are great. These are guys that haven’t traded the sound they love for a formula that would bring them fast money. They have stuck with a string band sound, and it’s brought them success. So listen to that platinum selling sing Wagon Wheel, and see for yourself why these guys deserve all the praise they are receiving.